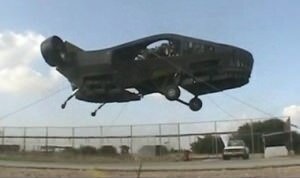 The AirMule is a compact, unmanned, single-engine, VTOL (Vertical Take Off and Landing) aircraft. Internal lift rotors enable the AirMule to fly inside obstructed (e.g. mountainous, wooded, urban) terrain where helicopters are unable to operate. The AirMule is innovative due to its internal rotors and significant payload capacity that allows for the evacuation of 2 casualties as well as fast and flexible payload reconfiguration for other missions. 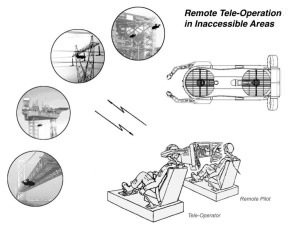 It is also ideally suited to special robotic operation, for example via Tele-Presence. Civil - AirMule offers much needed capabilities to emergency responders in routine, day-to-day operations as well as in the most challenging situations such as earthquakes and floods. The ability to quickly deliver water, food and medical supplies directly to affected populations—no matter how isolated—will save lives. During nuclear, biological or chemical emergencies AirMule offers transformative assessment and response capabilities. Day to day multiple mission capability (electric grids, bridge inspection, agricultural spraying, offshore oil platform support to name a few) makes AirMule a cost effective addition to any commercial helicopter fleet. Military - AirMule, a tactical Unmanned Aerial System (UAS) can help combatants reclaim an essential edge by enabling precise point to point logistic support and CasEvac solutions in battle conditions that are increasingly averse to conventional rotorcraft access. Today’s conflicts are increasingly defined by insurgents whose battlefields of choice are cities, villages and other environments that are inaccessible to helicopters. Supply convoys and medical teams entering these locations experience lethal threats unlike any that have been experienced in the past. AirMule’s internal rotor design and UA's patented Fancraft™ technologies enable AirMule to maneuver with unprecedented precision, safety and stealth in even the most constricted areas. Its minimal footprint is only slightly larger than that of a HUMVEE vehicle. By removing the human operator from the loop on most missions, AirMule can eliminate personnel exposure to operational hazards. A single AirMule is capable of ferrying 500 Kilograms of useful cargo per each 50 Kilometer radius sortie, thereby delivering approximately 6,000 Kilograms over 24 hours. A 10-12 AirMule “Mobile Supply Unit” can deliver supplies, day after day, to sustain 3,000 combatants, while at the same time ferrying back their wounded and casualties. AirMule can hover in place with high precision and operate in harsh weather and winds of up to 50 knots, a significant improvement over existing helicopters. 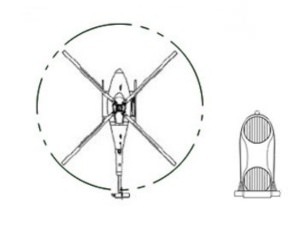 AirMule is designed to the most stringent FAA design requirements for Rotorcraft, resulting in an aircraft with very high safety and reliability. 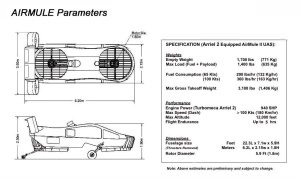 AirMule is equipped with a rocket deployed parachute, that will safely lower the complete vehicle and its payload from almost any height in the case of an unlikely malfunction of its engine or lift rotors.